Kristina McBride has published four novels for young adults - THE TENSION OF OPPOSITES, ONE MOMENT, A MILLION TIMES GOODNIGHT, and THE BAKERSVILLE DOZEN. Kristina is a former high school English teacher and yearbook advisor, as well as an adjunct professor at Antioch University Midwest and Wright State University. Kristina has a thing for music, trees, purses, and chocolate. You might be surprised to learn that Kristina was almost kidnapped when she was a child. She also bookstalks people on a regular basis. Kristina lives in Ohio with her husband and two young children. You can learn more at www.kristinamcbride.com. A Million Times Goodnight Goes to Italy! 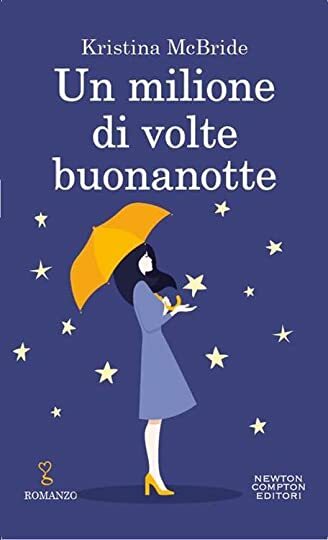 I’m delighted to report that my third novel, A MILLION TIMES GOODNIGHT, will be releasing in Italy with Newton Compton Editori in January of 2019. Here’s the new cover design! Bellissimo! This is a group for writing pieces and group critique. Feel free to share your writing with others and get feedback on it! I LOVED One Moment and was just wondering if there will be another book for Maggie and uhh you know who. Just curious to know. A fellow blogger and I have been chatting non stop about ..."
Hi Kristina - Thank you for your friendship. Expected release date mid-late Jan.
That sounds awesome, I'll see if I can come, thanks! It was so much fun to meet you! I was glad to give you the bookmarks. Wish I could have signed your book! I am writing novel # 2 of my 2-book deal - but it is not related to The Tension of Opposites. I kind of doubt about a sequel. If you're near Cincinnati this Saturday (the 2nd) there is a huge, all-day book festival at the Duke Energy Center. I'll be there signing books and would love to see you again! Hey, Kristina! I was lucky enough to meet you at the Smart Chicks Kick It tour in Dayton! Thank you so much for the signed bookmarks. I have a quick question; are you currently writing anymore novels? Oh, and is Tension of Opposites going to have a sequel? Abby wrote: "Do you have 'Catching Fire'? Is there any chance you could bring it to school on Thursday if you do? Thanks so much!!" I don't have it - I waited in line for the library copies. If you call the library, it should only take a week or so. IF you can wait that long :) They're good, huh? Do you have 'Catching Fire'? Is there any chance you could bring it to school on Thursday if you do? Thanks so much!! Nic wrote: "Thanks for adding me. I cant wait for your book to come out it sounds really good." Thanks for adding me! I hope you like The Tension of Opposites! Thanks for adding me. I cant wait for your book to come out it sounds really good. Hey Abby - I have read The Hunger Games and Catching Fire. Both awesome. #3 is due out in August. Thanks for the recommendation! Hope you're enjoying your break! The boy was talking about you the other day! Thanks, Brooke. I saw your profile and thought you just might be into my book with the faves you have listed. I hope you like it! Hellow from Australia :o) Thank you for asking to add me as a friend! I have your book on my to-read list (The Tension Of Opposites) - I'm very much looking forward to reading it! I saw your favorite authors - Sarah Dessen and Jodi Picoult are two of my faves as well - and I thought we should connect! I'll have to check our your other fave - Keckler, I think. Hope you enjoy "The Tension of Opposites" if you check it out! It releases May 25th - eek! Hey, Abby! Call me Kristi why dontcha? Funny, I never thought you might be stuck back all those years ago now that I see you so often! And you don't have to try to be mature, my friend! Scones & Sensibility is so good - a great one for you. It's out next week, I think. The cover is awesome too, isn't it? hey kristina! (i wanted to say ms. mcbride, but i'm trying really hard to be mature!) heehee i was looking at your 'to read' books, and i added 'scones and sensibility' to my 'to read' list, because it looks pretty great...see you - and grant - on thursday! Thanks so much! I saw your "About me" and we have so much in common, I thought I should friend you!